"Let me tell you how she did it… all on her own!" Here we go again! 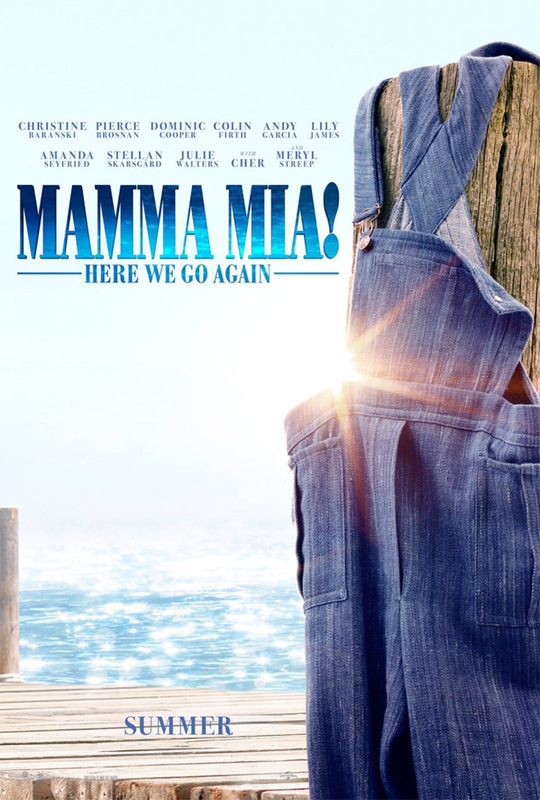 Universal has unveiled the first teaser trailer for the highly anticipated musical sequel Mamma Mia! Here We Go Again, which was a smash success when the original movie opened in 2012. Told through the music of ABBA, the story is about a woman trying to figure out who her real father is. This sequel is sort of a prequel, telling the story of how the three dads came into Donna's life. Lily James stars in this new one, as the younger Donna, Meryl Streep's character. The ensemble cast includes Amanda Seyfried, Christine Baranski, Meryl Streep, Colin Firth, Pierce Brosnan, Stellan Skarsgård, Dominic Cooper, Andy Garcia, Julie Walters, Cher, Jeremy Irvine, Alexa Davies, Naoko Mori, and Hugh Skinner. This looks like it's going to be a blast. A sequel to the 2008 musical comedy Mamma Mia!, featuring music from ABBA. "It's more of a prequel really, because it's about everything that happened before they ended up on Kalokairi island… It's Donna when she was young, Meryl Streep when she was young, and what happened when she met the three dads. As well as what happened after the previous film finishes. So it's a prequel and a sequel." Mamma Mia! Here We Go Again is both written and directed by English filmmaker Ol Parker, of the films Imagine Me & You and Now Is Good previously, as well as the script for The Best Exotic Marigold Hotel and its sequel. Universal will release Ol Parker's Mamma Mia! Here We Go Again in theaters everywhere starting on July 20th, 2018 next summer. Who's excited for more? First impression? Follow @mammamiamovie for more.